The family of 28-year-old Alejandro “Alex” Nieto, who was fatally shot by police officers at San Francisco’s Bernal Heights Park in March, filed a civil rights lawsuit this afternoon against the city following a march and rally against police brutality. The Nieto family’s lawyer, civil rights attorney John Burris, said today the lawsuit was filed on behalf of the Nieto family against the city for violation of Nieto’s civil rights on the grounds that police officers allegedly used excessive force against him. Nieto, a San Francisco native who lived in the heart of the Bernal Heights neighborhood on Cortland Avenue, was a security guard who attended City College of San Francisco with aspirations of being a probation officer. According to his friends and family members, Nieto was also a practicing Buddhist. 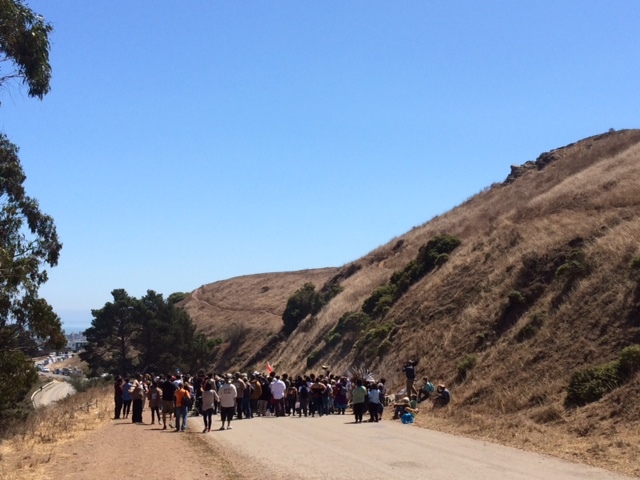 A group of about 100 protesters gathered under a cloudless sky today shortly after noon at Bernal Heights Park, where the fatal shooting took place on Mar. 21. A sunrise ceremony also took place at 5 a.m. this morning at that same spot in memory of Nieto’s life, according to the website Justice4AlexNieto.org. Protesters then traveled through the Mission District holding signs and banners. One banner read “End Racist Police Brutality” and another read “Stolen Lives, Killed by Law Enforcement,” and was adorned with photos of people shot by police, including Alex Nieto, Andy Lopez and Michael Brown. Another popular chant at today’s protest was “Hands Up, Don’t Shoot,” which has been heard at recent protests in Ferguson, Missouri following the fatal shooting of 18-year-old Michael Brown by police officers on Aug. 9. About a dozen police officers on motorcycles blocked intersections to help protesters safely cross the path of traffic this afternoon. The group blocked busy intersections such as 24th and Mission streets and stood in the center of Van Ness Avenue and Market Street to hold a moment of silence in honor of Ferguson, Missouri. Marching alongside protesters today were ambassadors with the Street Violence Intervention Program, a street outreach and violence intervention initiative run by the Mayor’s Office. 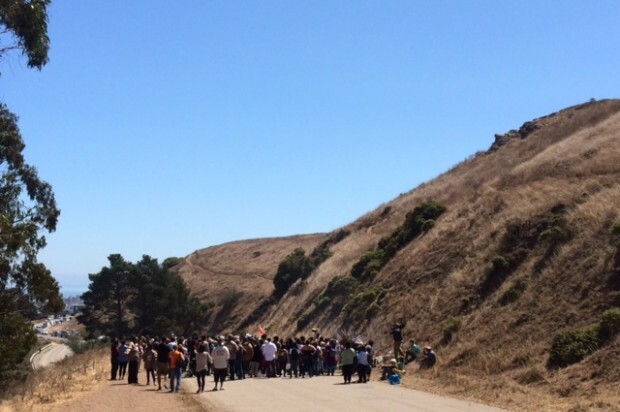 The ambassadors took on the role of security during the walk to the Phillip Burton Federal Building at 450 Golden Gate Ave. and provided water to protesters along the roughly 3-mile march. An activist in the crowd, Janie Lucia said she was out today to protest “the militarization of the police department,” which she said seems to be resulting in unnecessary violence. She said there are a lot of conflicting stories about what happened that day on Bernal Hill and that she is still waiting for authorities to release more information. Burris and other speakers at the rally urged Police Chief Greg Suhr, Mayor Ed Lee and District Attorney Dennis Herrera to release information about Nieto’s death, including the medical examiner’s report and the name of the officers who were involved in the shooting. Police Chief Greg Suhr discussed the incident at a town hall meeting in the week following the fatal shooting, explaining that a call came into police at 7:11 p.m. on Mar. 21 about a man at Bernal Heights Park wearing a bright red jacket with a black handgun on his hip pacing by a chain link fence near a bench. The chief said the caller described a man with his hand resting on what looked like a gun. Officers arrived at the park within minutes and encountered Nieto with what they believed to be a gun in a holster while standing about 75 feet away with his back against the setting sun. Suhr said Nieto pointed his weapon at several officers, prompting them to fire multiple rounds at him. Nieto was pronounced dead at the scene. “They fired in defense of their own lives,” Suhr said. Suhr said the officers thought Nieto had a firearm on him, but after the incident it was determined that because of mental health reasons, Nieto was prohibited from legally owning a gun. He had only a Taser stun gun on him at the time of the incident and Suhr said officers could have misconstrued it as a real gun. Nieto apparently had no criminal record, according to Suhr, but the week prior to his death a restraining order had been filed against him by a man who said he used to be friends with Nieto. In the court document requesting the restraining order, the man said he had been attacked by Nieto in front of his 3-year-old son and that he feared for his wife and his three young children. Nieto previously had a restraining order against the man, who described their deteriorated friendship as “bad blood” and in other court filings claimed Nieto had fired his Taser at him at least four times. Burris said today that he believes police shot Nieto as many as 10 times.